ProComp5 Infiniti provides the power and flexibility you need for real-time, data acquisition in a clinical, lab or field setting. ProComp5 Infiniti is housed in an ergonomically designed case and requires only a USB port to connect to any IBM compatible PC. ProComp5 Infiniti has the identical inputs as ProComp Infiniti, but omits the last 3 channels. The first two sensor channels provide ultimate signal fidelity (2048 samples per second) for viewing raw EEG, SEMG, EKG and HR/BVP signals, while the remaining 3 channels sample data at 256 samples/second for slower signals such as respiration, temperature, etc. Not only can ProComp5 Infiniti capture data in real time by connecting directly to the PC via its fiber-optic cable, but it can also store data on a Compact Flash memory card for uploading later to the PC, or use optional long-range compact flash module telemetry anytime it is desirable. All channels can be used with any combination of sensors, including EEG, EKG, RMS SEMG, Skin Conductance, Heart Rate, Blood Volume Pulse, and Respiration. 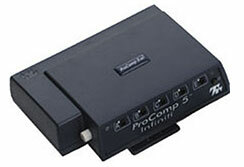 ProComp5 Infiniti is a trademark of Thought Technology Ltd.